Pleated water filters get their name from the pleated (folded) filter media that comprises them. These pleats increase the surface area of the cartridge which, as a result, provides greater contaminant holding capacity and longer filtration life. 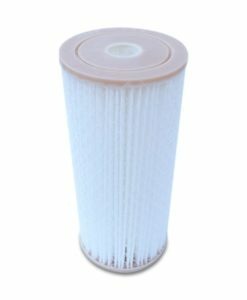 Pleated water filters outperform other “depth” style filters including wound, spun, melt blown, or resin bonded filters due to their increased surface area. Another significant advantage of pleated water filters is that they have lower pressure drop which means a high flow rate. 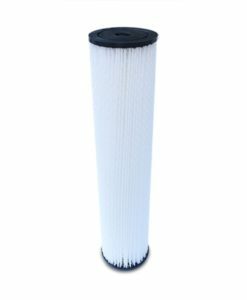 In fact, a smaller filter housing with a pleated water filter can have the same flow rate (or better) and filtration capabilities as a large filter housing with a non-pleated filter. (Smaller filter housings reduce capital equipment costs). And water filtration for a variety of markets including food / beverage / bottled water, pharmaceutical, cosmetics / personal care, micro-electronics, power generation, inks / paints / coatings, and more. At Premiere Sales, we stock premium, pleated 0.2 micron water filters in 10″ and 20″ lengths, available in both small (2.5″) and large (4.5″) diameters.